Your Eminence, when did it happen your first opportunity to meet with Pope John Paul II for the first time and what were your impressions of that meeting? My first meeting was very common to all of us, and it happened on television some minutes after his election, and I was struck immediately by his great devotion to the Virgin Mary from the first moment and then through nice expression "if I'm wrong you can correct me." Then his Installation Mass at the beginning of his Pontificate. I was struck so much by his passionate cry, then the first of many future screams "Do not be afraid ... open the doors to Christ ... open wide .." beautiful words which struck me so deeply. Then during my first meeting with him, in a personal visit, when I was paying my first "Ad limina Apostolorum' visit as a bishop of Gubbio. I think it happened back in 1985, during the lunch hour I was struck by his response that he gave to one of us, to a bishop from Umbria, we were a total of seven or eight ... the archbishop of Perugia asked him what he thought of Russia, the Soviet Union and he with a pensive face, but with great conviction said these words to us: 'The economic crisis will force Russia to change its course so quickly and so deeply that we cannot imagine. 'This was back in 1985, so many years before 1989 when effectively happenned the collapse of the Berlin Wall fell. So he had a deep perception, I am sure that he knew what was about to happen. I was so impressed with his great foresight and it seems that I am seeing him again saying those words! Your Eminence, in your opinion, what from Pope John Paul II's work will pass to history? First of all it will pass to history, his personality, his charm on humanity, and his holiness. 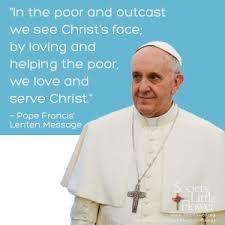 Soon the Church will beatify him. One can also forecat big crowds for this historical event. For the multitude of people who will travel ... You see when his person hit people. One can still not the great impact this personality has left on humanity. Then I can definitely say that it will surely go down in history his defense of human rights and later on he was instrumental for the collapse of communism. It makes me think of the famous stone of the vision of Nebuchadnezzar, falling from the mountain and shatters the big statue. Something very similar to this happened once again in our time. Then certainly will also pass to history his apostolic journeys so exciting that so many people have been approached by the Pope No? He had turned to be the pastor of the whole Church, but his pontificate became an electrifying experience,,,,,, I once heard about his program during a dinner in Orvieto. His program was that as bishop of Rome he would visit all the parishes, later, as Primate of Italy he would visit all the Italian dioceses, and after possibly would visit all the nations of the Earth. And he hoped to accomplish all this in about three or four years. He could not do this ... but almost. And so this is of great importance for the unity of the Church, as well as the missionary zeal that has managed to convey in the local churches. Then I would point out the Jubilee of course, the Great Jubilee. There have never been a jubilee so great as that of the year two thousand. I also include the dialogues, the inter-religious dialogues, especially the inter-religious meeting at Assisi. It was a new activity, it was not a meeting to pray together but a time together for prayer. Turning to God according to our various traditions..He saw in this the possibilitiy of a collaborative dialogue, an imperfect union but respectful of the diversity of the vaious traditions. Clearly the Church proposed the Gospels as it proposes to all the conversion to Our Lord Jesus Christ but in all religions, in all men of goodwill the Lord is already working in their hearts. Obviously even his overwhelming feeling to the youth. I would say so. General Secretary of the Italian Bishops Conference, Cardinal and Archbishop of Florence. Roles entrusted to you by John Paul II. What can you comment on this? With this list I can add my episcopal ordination because when Karol Wojtyla was elected Pope , I was a simple country priest. I used to live in community with two other priests in the country and also taught theology in Assisi ... but I was a country priest, unknown to anyone outside of my diocese. Then my appointment to the Bishopric of Gubbio, years later the appointment of Archbishop of Perugia, the appointment of General Secretary of CEI, the appointment of Archbishop of Florence and my elevation to the College of Cardinals. I have started this journey during the ponificate of this foreign Pope when I was a simple country priest and concluded when I was presiding a Pontifical Council as a cardinal. I am the first to be amazed, astonished and wonder about the games of providence. That's fun. I also think about the Lord God, right? He opens the streets that no one would have ever imagined. How many bridges did in fact Pope John Paul II rebuilt during his long pontificate? He did re-built the important bridge with the people of God spread over the whole earth through his apostolic journeys. The Pope has reached out to every nation. Going to Mexico, I could verify the Mexican's attachment to this Pope, but also in Malta the same thing occurred again to me. But in Mexico I was struck by the fact that every time one mentions John Paul II in any context, in any discussion there was immediately a round of applause. And this it impressed me a lot. So I would say this Pope's closeness to all people and then also I need to mention another bridge built by him, the inter-religious dialogue, the dialogue with all people of good will. I think this was also a very important bridge erected by him. What did the family mean to this great Pope? Well, I guess that with the youths, the family was his pastoral priority. He indicated so to the Church, to all the diocese and to all the Episcopal conferences. And not just a pastoral strategy to the family because in today’s world there are very strong challenges, very hard ones on the family, but for theological reasons, I would say first of all, the Pope reflected at length on the sacramentality of the family and indicated primordial sacramentality, marriage as a sacrament of creation, the primordial sacrament of creation, that is, an 'image, a participation in the life of God because God is one but three persons, Father, Son and Holy Spirit. He created man in His own image and likeness, male and female he created them. This image is also in the couple. And this fact is true for all families to the extent that they are true families where they live a true marriage participate even if they did not know the life of God, they are an image of God. Marriage is not only Eros but even Agape' that is the donation, dedication, sacrifice to each other. Then also the deepening of the sacrament of marriage as a sacrament of the New Alliance for which the family was able to strongly emphasize as the little church concept not only as a vague analogy, but because it is the real implementation of the mystery of the Church. And as the church is called to make Christ present in the midst of the members of the family and through the family environment, in society, in the Church. “Where two or more are gathered in My name, I am there among them”! This is achieved not only for the good will but for the grace of Christ. Himself who calls the spouses to share the love with whom he loves the Church. He donates, provides this power of love with which we believe to take seriously, whom really cooperate with the Lord and becomes and produces that small Church and becomes a sign of Christ's presence, in the world. This is truly the Church’s mission. Then the family is that little Church so to speak. Then he dedicated to the family that splendid document 'the' Familiaris Consortio '. It is all about marriage preparation, education, love, sexuality built on true love, serious preparation for marriage with an itinerary of Christian experience and then after marriage the additional accompaniment that the parishes through their pastoral works need to offer to families by providing them with opportunities to meet with a permanent and continuous community formation. All this had indicated that the family was not only one of the many things that the Pope was in charge of. but was so deeply to his heart. 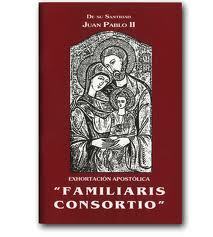 The Apostolic Exhortation "Familiaris Consortio"